The European Commission’s official spokesman, Margaritis Schinas, said that a no-deal Brexit would result in a hard border on Ireland. Sputnik discussed the comment with Gail McElroy, a professor of political science at Trinity College, Dublin. Gail McElroy: It's very difficult to say, there's a lot of speculation, "did Margaritis Schinas speak out of turn? Was it just on the spur of the moment, or was this a concerted signal to Ireland to soften their stance with the border between Britain and the Republic of Ireland? "; very, very difficult. It seems to be the case that there's a lot of denial in the Republic of Ireland at the moment and they're saying that is not actually the stance of Brussels and the European Union, but the chief spokesman for the commission rarely speaks out of turn. So the cat has been set amongst the pigeons. Sputnik: What could Prime Minister Theresa May realistically do to salvage her deal in such a short term? From my point of view, it's absolutely no time at all; it's not going to happen, is it? Gail McElroy: No, it seems unlikely given the scale of the majority in the vote last week. She might be able to convince 50-60 more MPs — 230 that just seems unrealistic. She does seem to be running down the clock, this seems to have been the strategy; there are only 65 days to go. But bear in mind, there's always the kind of "get out of jail clause". The European Court of Justice has said they can revoke Article 50 at any time before 29 March and [so] the status quo and the UK staying in the EU actually remains. There're so many options on the table, but the one that seems least likely is that the deal, as she's currently constructed it, will pass through the House of Commons. Sputnik: Sony has announced recently that they will be moving their headquarters to avoid Brexit disruption. If that is the case, do you think this could lead to more companies following Sony's example? What's your take on this? Gail McElroy: Yes. Clearly business leaders are very alarmed in Britain and the prime minister has held private conversations with them trying to calm the mood; but Sony moving to Amsterdam is a real problem. We have Dyson, which is kind of a classic British company — it's very, very British, makes these hoovers and vacuums, and air filters — they're moving to Singapore and they say it's purely a business decision. It's quite ironic, because the leader of Dyson was actually a strong Leaver, so it seems a bit hypocritical. There's a lot of capital and finance moving to Dublin and Frankfurt. Business leaders are very, very worried in Britain. Sputnik: In your view, can this kind of pressure from the big companies that you've just been alluding to in your last answer — such as Sony and Dyson — making such shifts lead to a softer Brexit deal being negotiated and being accepted by the MPs and the general public? I was listening to Sky News the other evening and they were interviewing a group of the people in Leeds, and the majority of them were saying "we're happy to go with a no deal scenario" because they were so fed up with the way the European Union and the British government have been taking so long with these protracted negotiations. Gail McElroy: It's an interesting one, the public opinion has barely shifted, but it has shifted to a majority for remain. It's hard to know if there was a second referendum what would happen. I think that the groups of people that were interviewed on TV are very, very misleading; it really isn't indicative of the general mood. And you should bear in mind that one Leaver dies every minute and one Remainer turns 18; so there's probably a majority if there was a second referendum for remain at this stage, but the general British public is bored and confused by the whole Brexit negotiations. It's very complicated, very technical, very difficult to actually sell to the public. 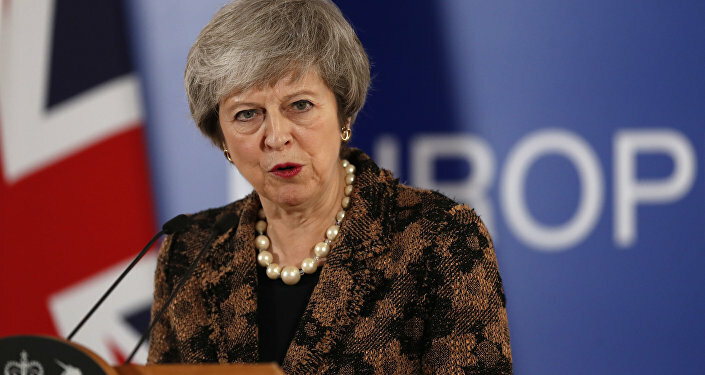 Certainly business is strongly lobbying for a softer deal, so a Norway plus deal might actually gain a majority in the House of Commons, but there are a large group of 80 to 100 very, very strong Brexiteers in the Conservative Party who are causing a headache for Prime Minister May. Sputnik: What's your prediction come the 29 March, where are we going to be? Gail McElroy: I think the can will be kicked down the road, there will be at least a three-month stay of execution, complicated by the fact that there are European Parliament elections in May; but the European Union will allow a stay of execution. But, of course, that doesn't solve the problem, it just kicks the can down the road. The views expressed in this article are solely those of Gail McElroy and do not necessarily reflect the official position of Sputnik.